By: Tania Sanchez, Open Government Guide Coordinator at Transparency and Accountability Initiative, [email protected]. Are you struggling to make government and public institutions in your country more transparent and accountable to citizens? If so, here’s a chance to improve your battle plan and tool up for the fight ahead. The Transparency and Accountability Initiative is constantly updating and expanding the Open Government Guide. Currently covering 22 different transparency-related topics, the guide enables transparency advocates to quickly and easily identify possible courses of action, link up with others working in the field, access global standards to hold their governments accountable against, and find examples of how people elsewhere succeeded in increasing transparency in the same field. Take, for example, the environment. If you’re an activist fighting against environmental destruction, you can with one click go onto the environment page of the Open Government Guide. There, you will find a list of commitments that governments elsewhere have made. One of these commitments is increasing the participation of poor and marginalized groups in environmental decision-making, a perennial weak spot in many countries, notably in decision-making on logging concessions. You decide that this is a real problem in your country and click on the link. This takes you to a dedicated page that briefly explains why including poor and marginalized groups is important and provides some recommendations as to what governments could and should do – for example, establish operational guidelines for agencies to involve poor and excluded communities. It also lists applicable standards, which can be extremely useful. For example, if you’re an expert in environmental legislation, you have probably heard of the Aarhus Convention, but you might not have thought of using the UN Declaration on the Rights of Indigenous Peoples to push for your case. The Open Government Guide can also help you to avoid re-inventing the wheel or, worse, repeating the mistakes made by others. So you can take a quick look at a study that summarizes the problems encountered by civil society groups and government agencies that have tried to give a voice to the poor in the past, and that provides practical tips for future efforts. Best of all, there’s a list of practical solutions that people elsewhere have developed, for example Chile’s environmental impact assessment regulations, which make special provisions for indigenous people, or the Philippine law that ensures that poor people get a say in how the national park next door is managed. 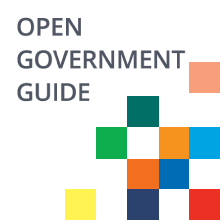 The Open Government Guide now includes hundreds of similar pages, and we’re going to expand it even further as the months and years go by. The topics covered span everything from budget transparency (ever heard of the GIFT Principles for fiscal transparency?) over whistleblowing (what about setting up a confidential advice service for whistleblowers?) to public procurement (why not follow the example of Ecuador, which saved over 300 million dollars by consolidating health sector procurement?). There’s no more need for transparency activists to stumble along in the dark, groping for solutions. All the information you need is easily, just one click away. Click here to begin developing your own battle plan.